Keeping spirits high during yet another seemingly endless 9-5 filled week is a tough task, so these full-time slackers thought of a creative way to make their, and others’, lives much more entertaining. The name of this grocery store is called Compare Foods, but we highly doubt that by that the store owner wanted its employees to actually compare the different types of foods that are available for purchase. 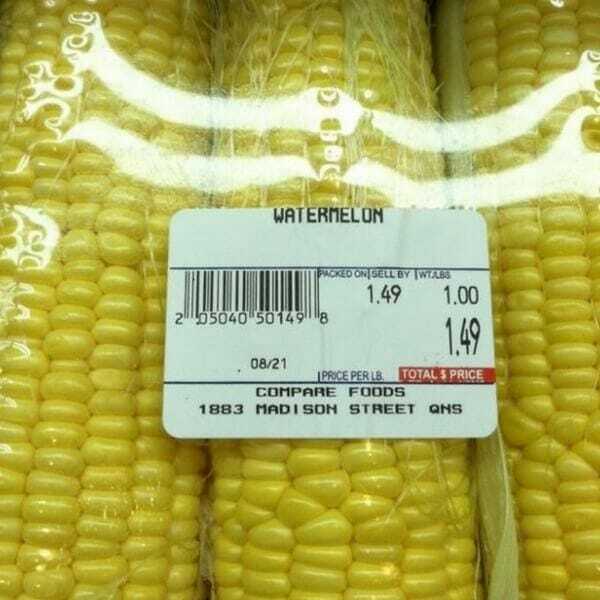 Even if this was the entire concept of the place, it is hard to imagine why anyone would ever compare between corn and watermelon – if anything, it makes more sense to defy the well-known phrase and compare apples and oranges. We’ve got spirit, yes we do, we’ve got spirit how ’bout you? Nobody has ‘spirt’. It seems like the cheerleading squad is in desperate need for an editor. This had to be embarrassing for these four cheerleaders holding the sign. People already like to joke about the stereotype that cheerleaders aren’t the brightest bulbs, and this sign doesn’t help their case at all. Hopefully they got a good laugh! Culinary tastes change from one country, sometimes to a drastic extent. While some are due to ethnic differences, other food preferences can also be because of climate differences and what is available to grow in the country. The one thing that is hard to imagine others confused about is the concept of which bun shape is intended for what type of BBQ meat. After all, hot dogs are longer and narrower when compared to the flat, circular patty that makes a hamburger. How could anyone get these two confused? 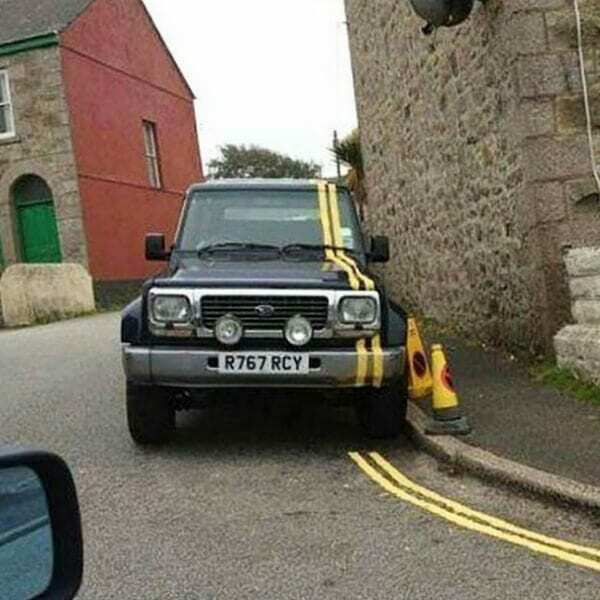 To be fair, a sign was most likely put up the previous night, asking those who parked in the street to move their vehicles so that this paint job could be done the next morning. The fact that this car’s owner simply missed the sign or decided to ignore it all together is completely on him. Can someone say ‘revenge.’ This definitely was not an accident. The weekly limbo club meetings were held in an underground studio that reeked of the sewage system below. After raising their concerns towards the local municipality and demanding a suitable space would be found for the group, their prayers have been answered and the perfect spot was named the club’s official domain. To make them all feel much more welcome and at home, a bar was placed outside the club’s door, forcing any attendant to earn their way in. Topsy-turvy Australia has always had other regions of the world perplexed with its way of living. Whether it is their inexplicable tastebuds that developed a love of marmite, exotic wildlife that is extremely rare, or seasons that are opposite than the ones we are accustomed to, Aussies do everything their way – or no way at all. 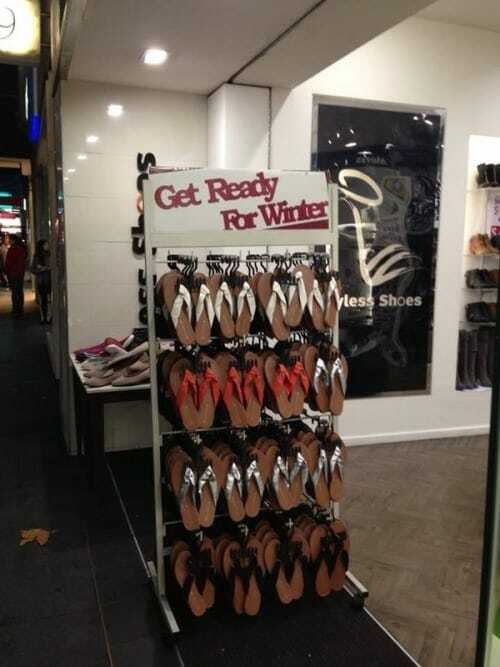 As can be seen in the picture, Aussies’ Winter footwear is one that is very different than ours – unless this was the job of a rebellious worker from the other side of the world. 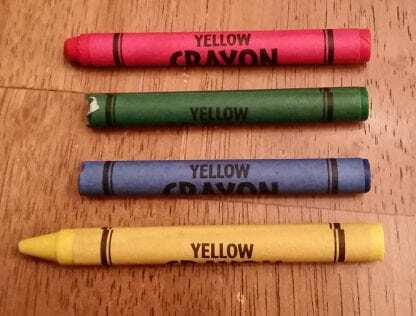 Instead of using their concept of printing out a label reading the color of the crayon for good, these crayons essentially confused colorblind people all over the world with these misprints. We are big fans of the color yellow, but it is evident that the person who printed out these labels is even more invested in the color than we are. Perhaps the person behind this was sick of racial prejudice and wanted to prove a point by assessing that love is colorblind. 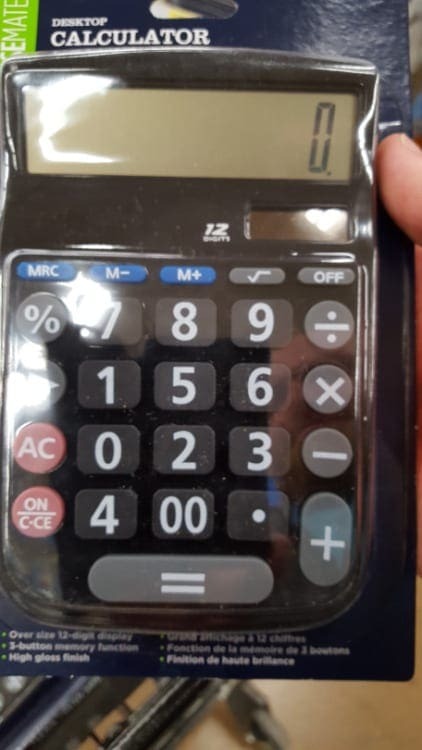 If the kid who received this calculator as a gift is brought up fearing having to deal with numbers and despising anything that remotely constitutes as math, it is probably because whoever positioned the numbers in this calculator caused him to stay clear of anything digit-related for the rest of his life. The numeral trauma could probably be treated after several therapy sessions, but this could have been avoided if the person in charge paid closer attention to what they were doing. Being a writer is not an easy task, as many people might be quick to assume. It relies greatly on inspiration, which means that if the moment does not strike you right, it could be rather frustrating staring at a blank page without having any words or thoughts that come to mind. 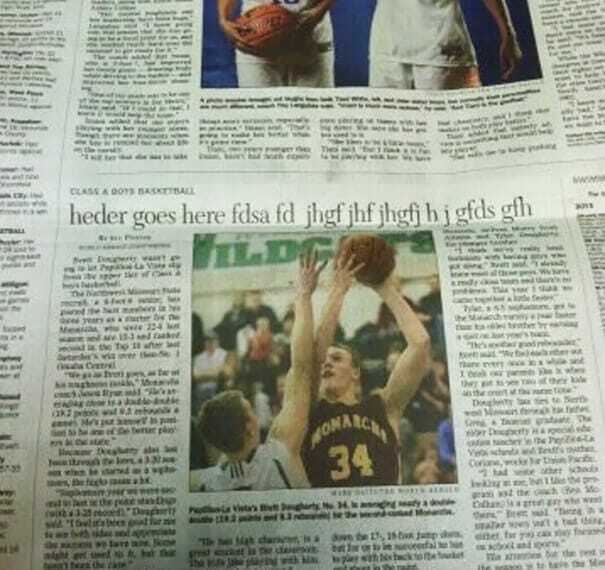 The journalist that was put in charge of covering this basketball game probably left the heading for the end, hoping some stroke of genius would hit him – only he evidently forgot to fix this nonsense-jumble that was written initially. Either the landscape artist who designed this park should be banned from any other urban projects, or the mayor of the city should be canned for not making sure the person hired for the job had a basic grasp of how sewers work. 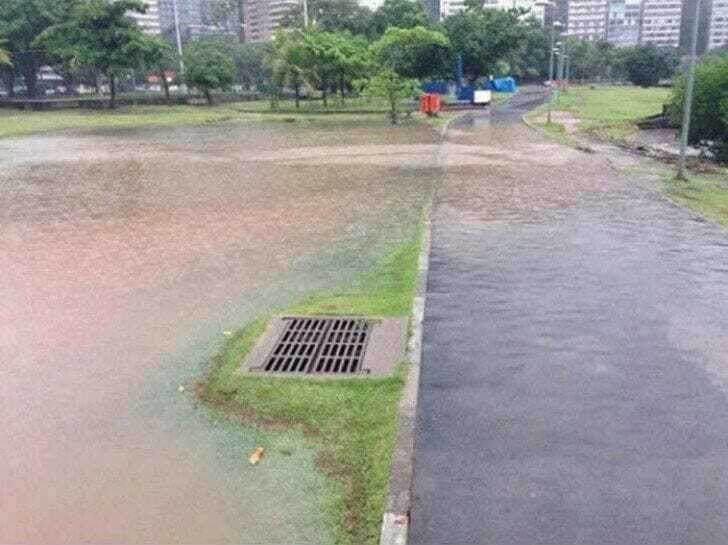 We just hope the sewer was leveled down before it got to pouring even harder since a mistake like this could end up drowning all the trees and plants in the park, in addition to the unbearable mud. As far as passersby are concerned, this could be an ad that is meant to emphasize the importance of self-confidence and feeling comfortable in your own skin. The one dress “you need in your closet, now” could very much be one’s birthday suit, as it is the one you cannot change – so you need to appreciate what you’ve got! 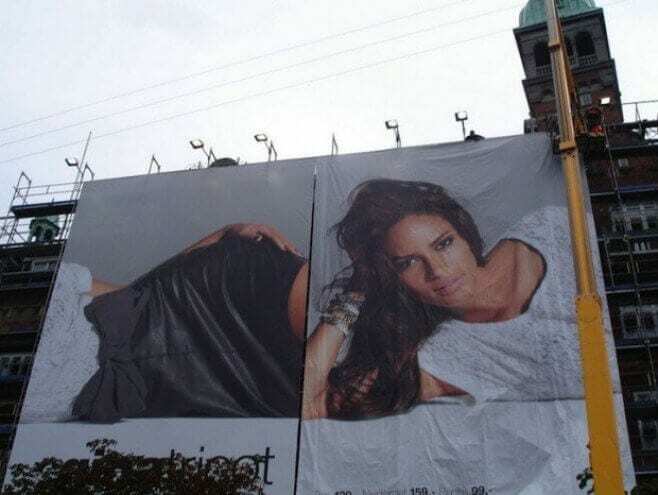 On the other hand, this could just be an error made by a lazy employee, who hung up that bold sign and decided to put up the dress the next day. Remember that geography teacher that scolded the classroom for not being more familiar with the map of the world? Well, it turns out she was right after all. 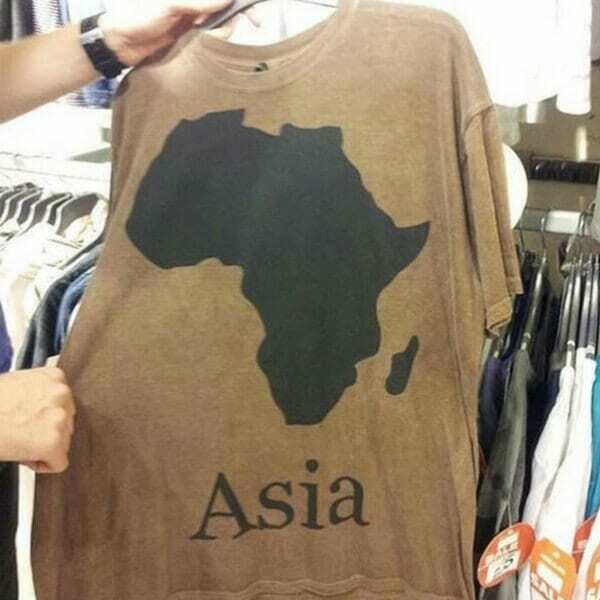 Never would have this fashion designer thought to check twice the T-shirts that were sent out to the stores, but that just goes to show the importance of double checking. On a more positive note, at least both continents start with the letter A, so we guess it could be relatively easily fixed with a fabric dye. Now here is a sight you do not come across often – a sign defying its very own instructions! 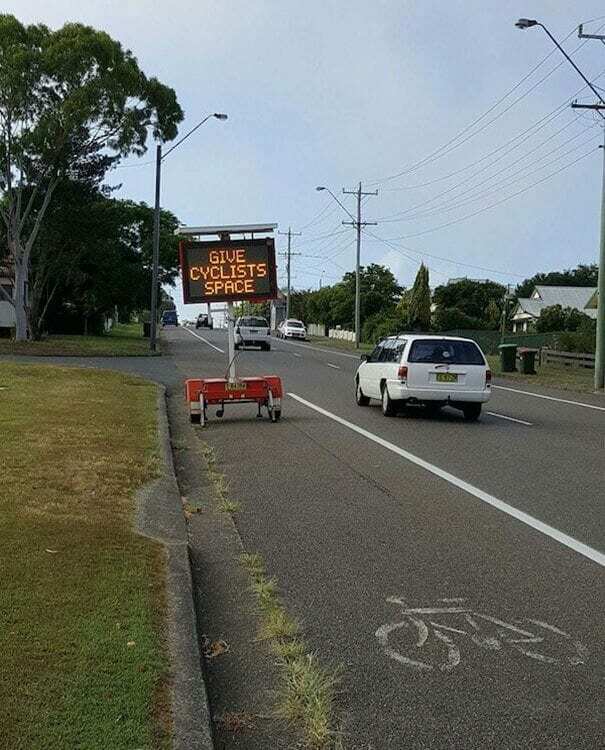 Reading “give cyclists space”, it is pretty hilarious that whoever positioned the sign here had absolutely no regard as to what was written on it and the fact they were contradicting what was asked in this clearly lit sign. It is a good thing this cart has wheels on it, since it means it was much easier to move, thus making the mistake easier to fix. 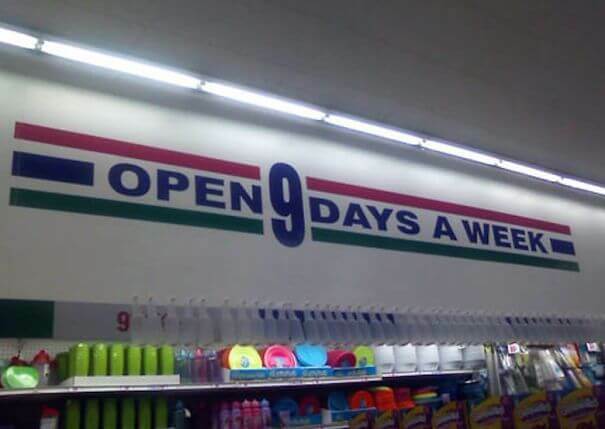 We are not sure how employees of this store count their weeks, but as far as the rest of the world goes, a week consists of only 7 days. Perhaps whoever was meant to paint that sign on the wall did not have a stencil for the number 7, so they thought they might as well make do with the template they do have and let buying customers deal with the confusion caused. If anything, this questionable sign could bring in all sort of business from those who are amused by it. Putting aside the fact this ice cream cone is impossible to eat without getting melted dark chocolate all over your fingers, we would love to run into the employee who felt like pulling a stunt and dipped the cone with chocolate instead of covering the ice cream with the sweet treat. If this was a during Halloween, the person held responsible should be applauded for providing both a trick and a treat, which is rather hard to pull off. If this was an employee of the month test, whoever stacked these cardboard boxes was sure to flunk miserably. 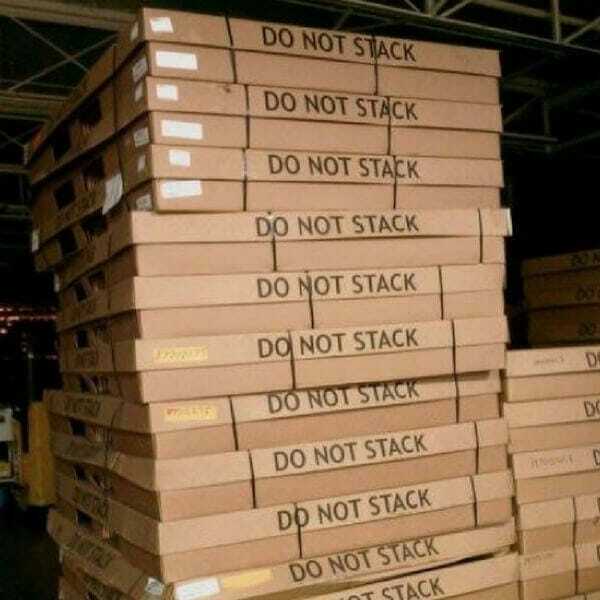 There is a clear instruction on the boxes that forbids anyone from stacking them for whatever reason, so we find it hard to think of a reason anyone would ignore the distinct warning. This could be the job of a person who was desperate to lose their job and was unable to do the mature thing, which is step into their employer’s office and hand in their resignation. Modern day technological advances might not be completely comprehensible for everybody, but considering the fact almost every person in a first world country has a smartphone, one would think there would be a consensus about what could be used to record someone – and a remote control for the television would not be it. However, we have to admit that seeing this person stick a remote control in this athlete’s face is absolutely hilarious, so we will give the guy credit for that. Cinema managers, along with professionals in fields like travel bloggers and food critics, probably have one of the most fun occupations out there. When a new film comes out, they are the first ones to watch it, and can always sneak their friends in without having to charge them for seat tickets. 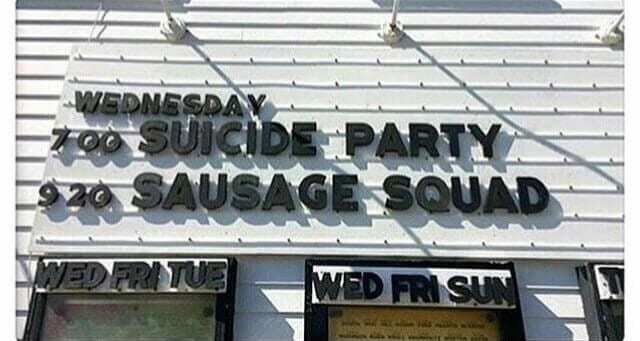 Whoever works at this place took their freedom too far, and mixed up the names of the two movies, Suicide Squad and Sausage Party, thus creating an R-rated film and a highly distressing movie. 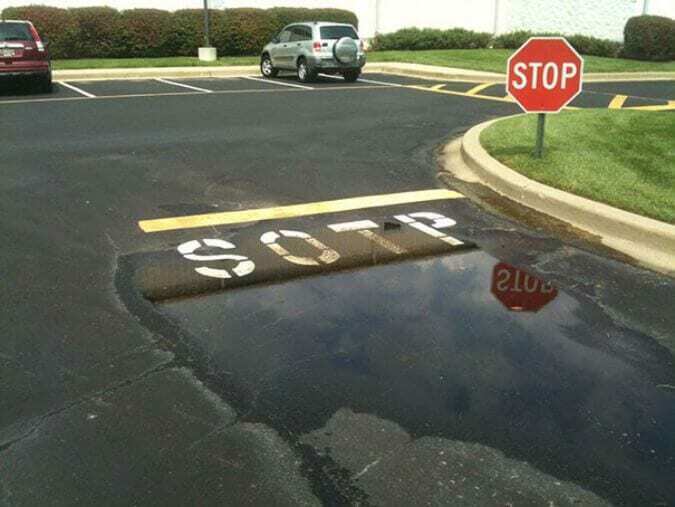 We are going to go out on a limb here and take a wild guess that whoever spray painted the road to say ‘stop’ did not pay close attention to what they were doing, otherwise the job probably would have been done correctly and the road would not have read ‘sotp.’ This is especially funny considering there is clearly a stop sign right above the stop markings on the road, meaning there was no room for confusion as to how the word should be spelled. The hotel staff at this resort has had enough of being mistreated by the upper management, so they decided to get even in the best way. Instead of setting up a strike or making waves with a loud demonstration, they workers employed on site decided to disobey the rules that were put up to keep order in the establishment. 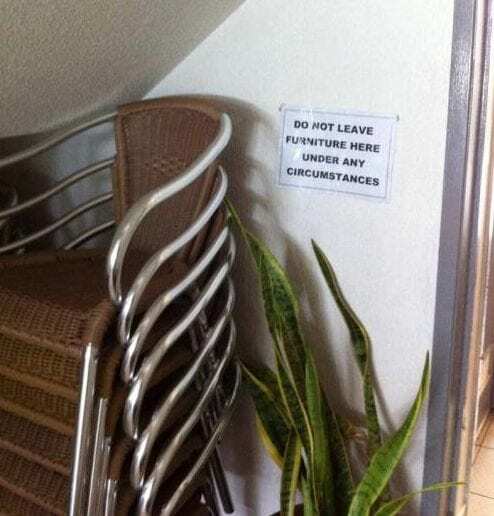 An example of this can be seen in the picture below, where pool chairs were stacked up next to a sign clearly forbidding from doing so. 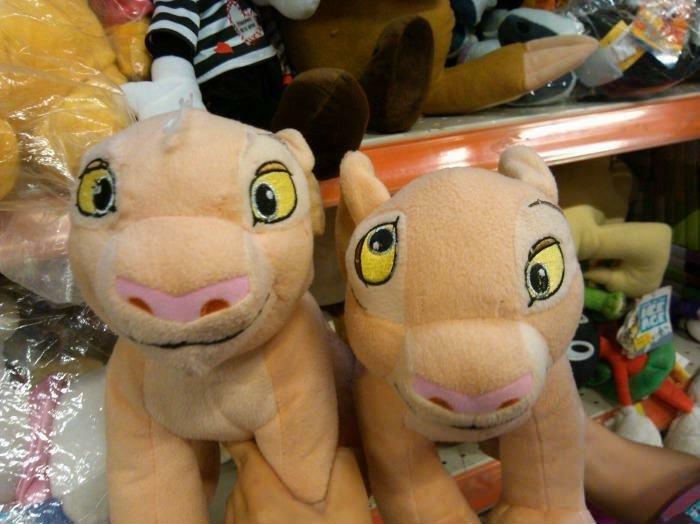 It might have been a while since the last time we watched The Lion King, or any other Disney movie for that matter, but we seriously doubt Nala had her eyes positioned this way. This is obviously a sewing job gone horribly wrong, and one that could wind up some poor kid with nightmares whenever bringing up any word associated with the film, so if we were working at this store we would definitely put the stuffed animal aside so that no one picks it up. 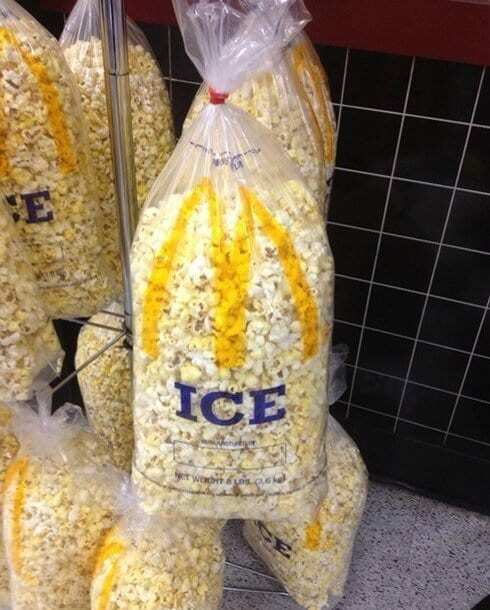 McDonald’s needs to read the label on those bags again, because popcorn is definitely not ice. Last time we checked the fast food franchise does not even sell the cinematic corn snack, so how it ended up filling the ice bags is beyond us. It is not as if paying customers would not be glad to have a salty snack to munch on as they wait for their Happy Meals, but rather that we hope actual ice was delivered to help cool down those much needed soft drinks. 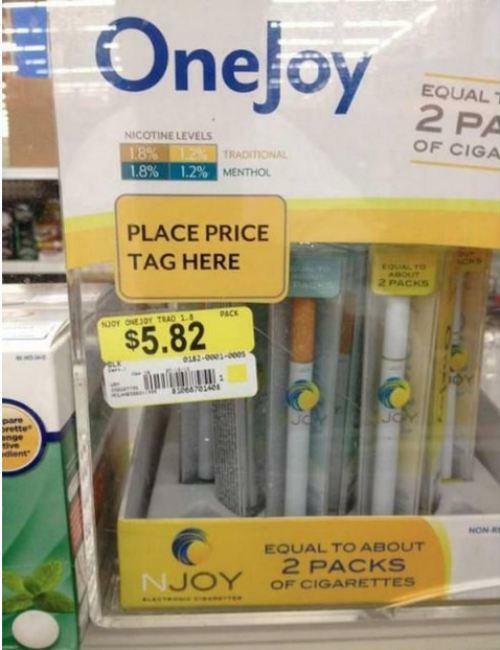 The person put in charge of sticking the price tags on new merchandise clearly had enough of labeled boxes telling him what to do. 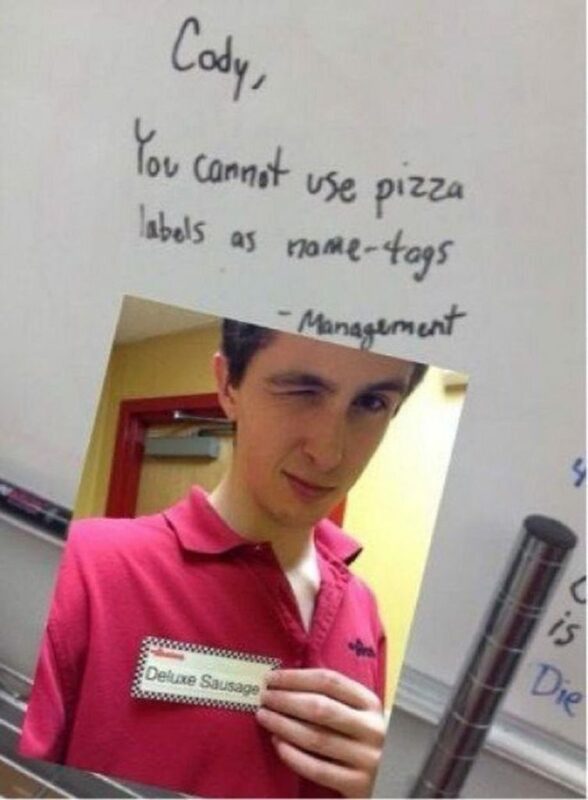 In a rebellious moment, he decided this was finally the time to call out “it’s my way or the highway!” and do exactly what he wanted to do ever since he started working as a label sticker at that supply shop – which is whatever he wanted. If only other lawbreakers would have committed the same type of “crimes”, the world would be a much safer place. 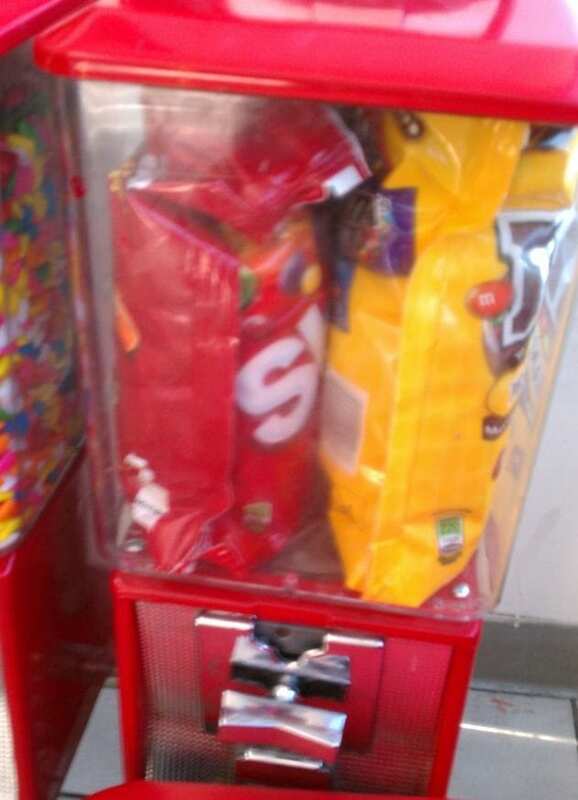 We are going to go on a wild guess here and say that whoever was put in charge of placing the bitesize candy wrappers inside this machine probably was not in the mood for reading out the clear cut instructions that came with the gig. To be fair, it probably did just say to put the Skittles and M&Ms inside after removing the plasticl lid with the correct key, but they should have figured out no one would be able to squeeze the entire bag out of that tiny hole. Nation pride is completely understandable, and we are all for waving the flag with love and praising the land of the free for its endless accomplishments and fascinating history that winded the people of America safe and home, but the positioning of the printed stripey flag could not have been placed at a less appropriate spot. 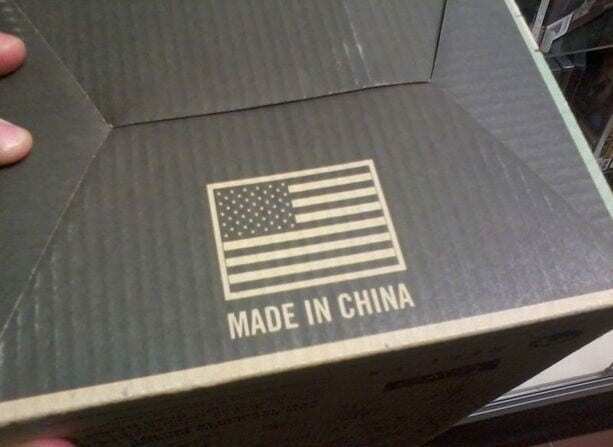 After all, we would not want anyone to confuse the American flag with the Chinese one, now would we? Hopefully, no one suffering from the obsessive-compulsive disorder, also known as OCD, will ever cross this pathway, as it will drive them absolutely mad – and it is easy to understand why. We do not suffer from the mental disorder (as far as we know) but still cannot help but feel as though something is troubling us extensively simply by watching this clear abuse of power. 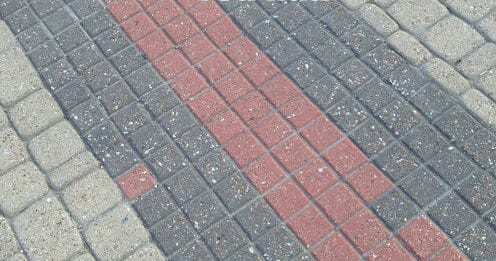 It is almost as though someone did this on purpose just to mess with poor passersby’s heads! It does not take a biology major to tell the difference between the terrifying tarantula, nor do you need to be an insect expert to know that a cockroach is not the same thing as a spider. 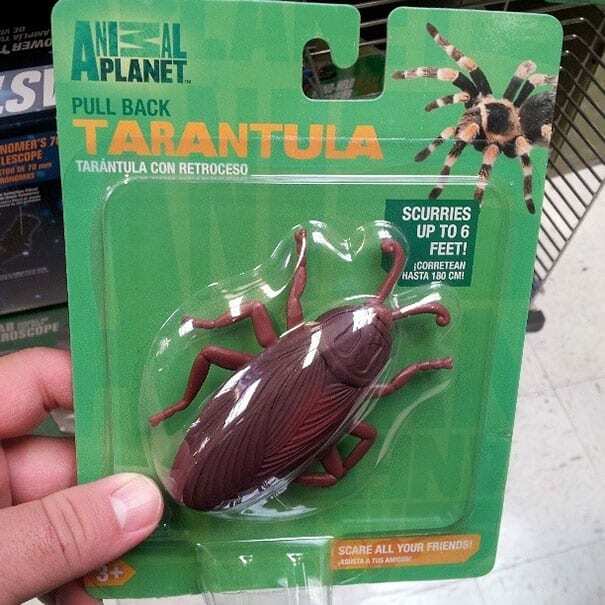 Whoever printed this toy wrapper even went as far as to add a picture of the real insect that should be put in the case, just so a mistake like this does not happen. That is not to say, however, that throwing a plastic cockroach on someone would not terrify them. We are not sure what school this stand is referring to, but we sure want to find out – just so we do not accidently sign up our kids there. 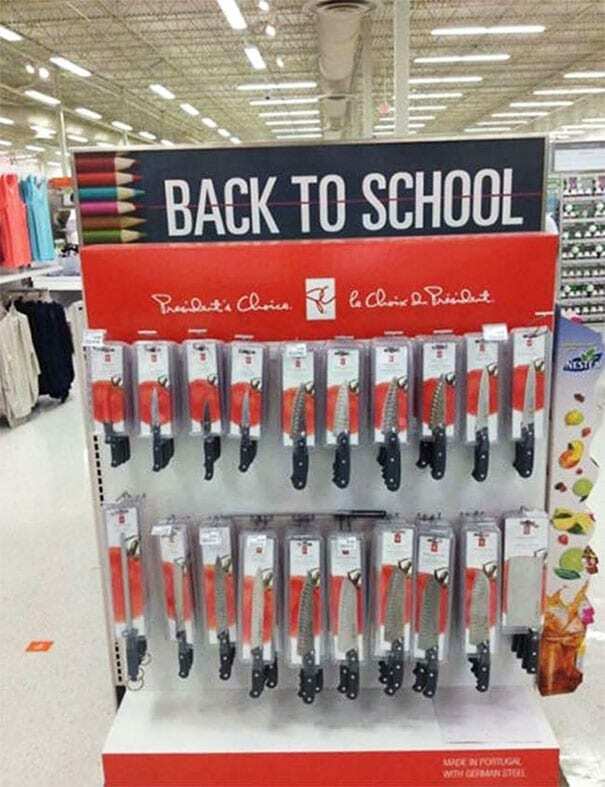 Times have definitely changed, but unless English Literature class was scraped off to make room for vegetable chopping lessons, we are going to guess that whoever placed these knives on that rack is either looking for trouble from their boss or has no idea what goes on in educational facilities. Speedo decided that instead of lying with false advertising, they are much better off painting a different picture, of a reliable store here to present things the way they are. 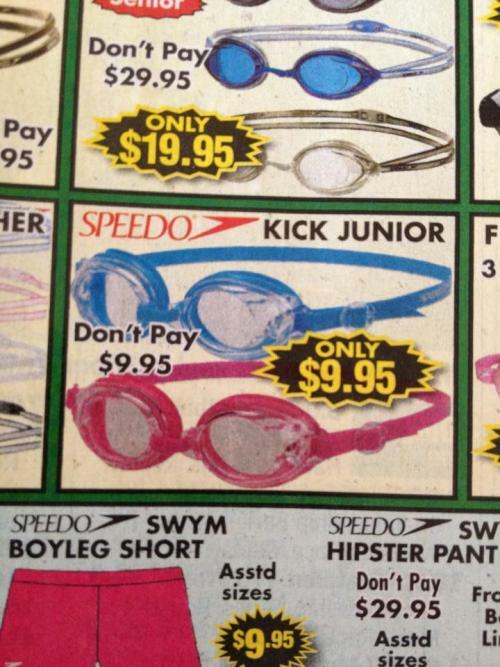 Sure, the Kick Junior swimming goggles advertisement could have read that the original price was much higher than the discount one offered now, but for a reason that is beyond our comprehension, the advertisers in charge of this promotion saw things very differently, giving out a conflicting and contradicting message. Technology is supposed to be the embodiment of modernity and up to date innovations – for this reason, having a remote control that points toward the left and is labeled ‘Right’ and vice versa kind of makes us wonder what kind of TV this customer is going to be receiving. We would not be confident with this purchase, but this could also be an innoccent error made by those in charge of printing the remote control buttons. At least this problem is easily fixed with a sticker. She was more than a little confused when she walked into Walmart and almost tripped over a hurdle one of the employees put up. 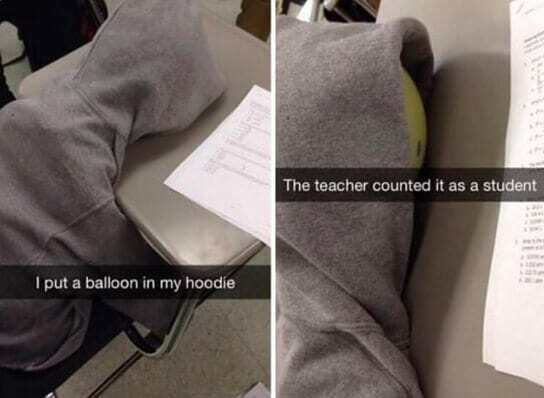 Hopefully, she didn’t hurt herself. 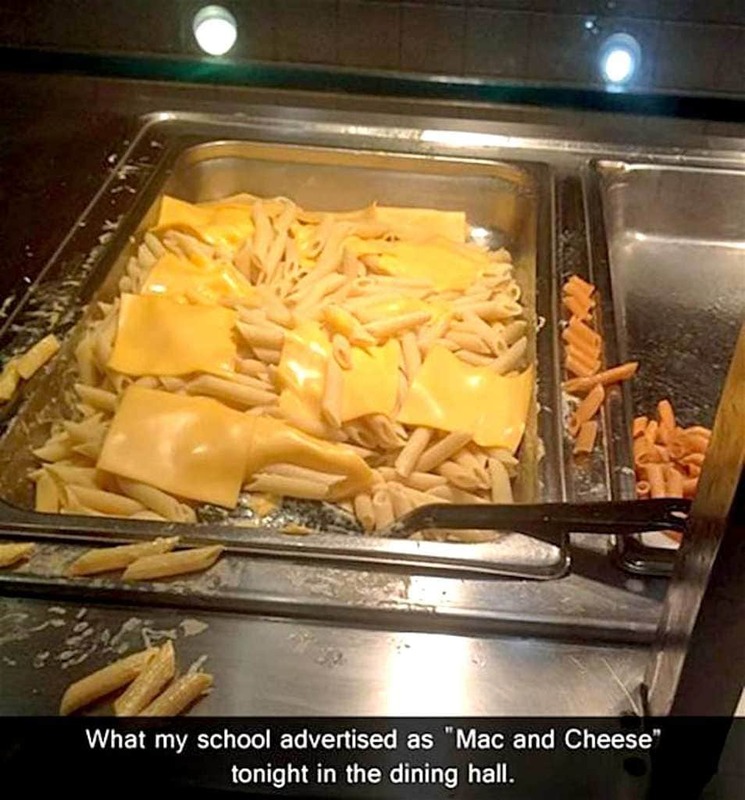 Whichever employee thought it was okay to market this meal as Mac N’ Cheese was seriously mistaken. No one was fooled and people were not happy. Whoever came up with this sign is probably the best team member to have during a game of Taboo, but they probably should not have been trusted with printing out signs for merchandise in a grocery store. 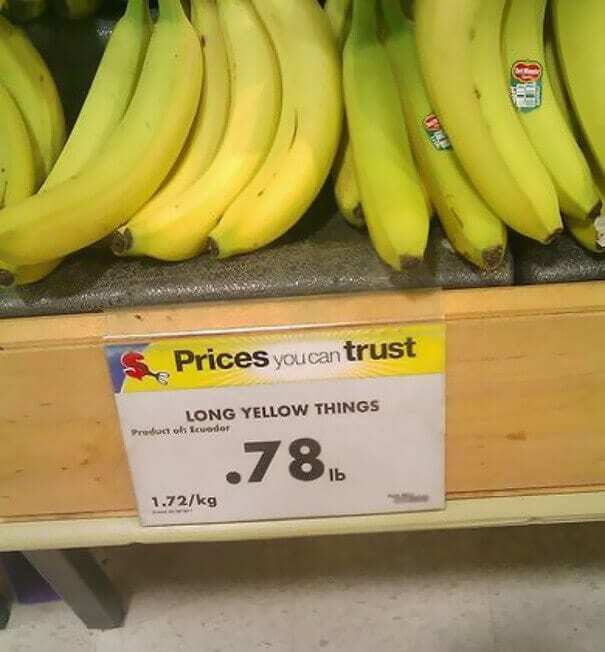 Although ‘long yellow things’ is the most accurate description we can think of, ‘bananas’ would have sufficed. 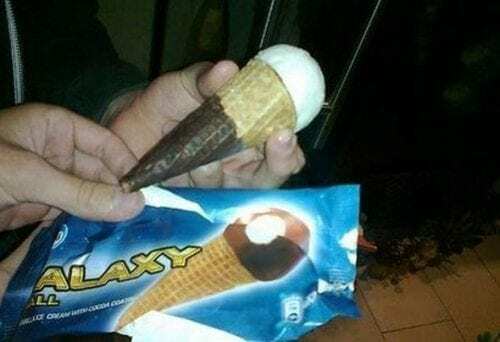 Talk about false advertising, this is amongst the worst that we have seen! 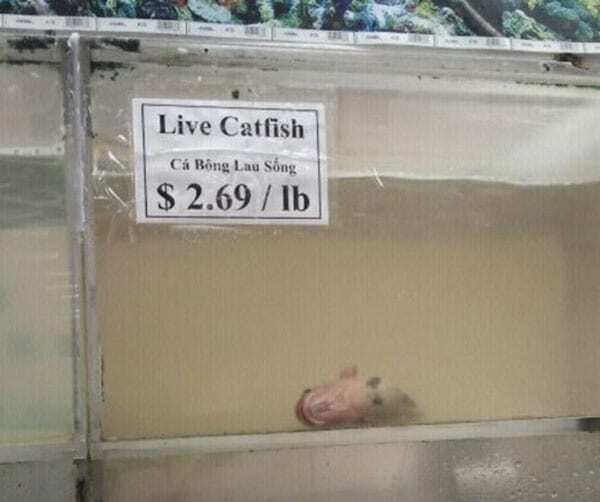 Whoever was in charge of checking the well being of this Catfish failed miserably. Perhaps it has something to do with the water in the tank being a murky color, and that can’t have been too healthy for this poor fish. Alternatively, maybe the store intended to sell it dead and that’s why they kept it lying alone at the bottom of the tank? We’ll probably never know. RIP fish. Walking up the stairs to the gym, one cannot help but wonder if they would not rather be at home at that exact moment, being a couch potato and binge-watching their favorite show on Netflix. And can we blame them? We are exactly the same. 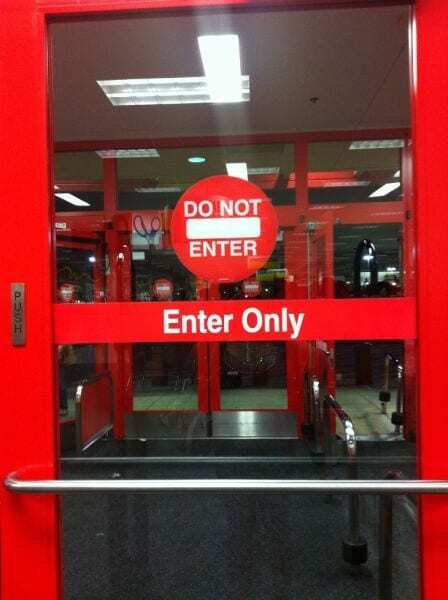 That is why this door’s sign, that definitely was a mistake due to its contradicting message, also acts as a screening process passageway for those who have yet to decide whether they intend on working out or not. 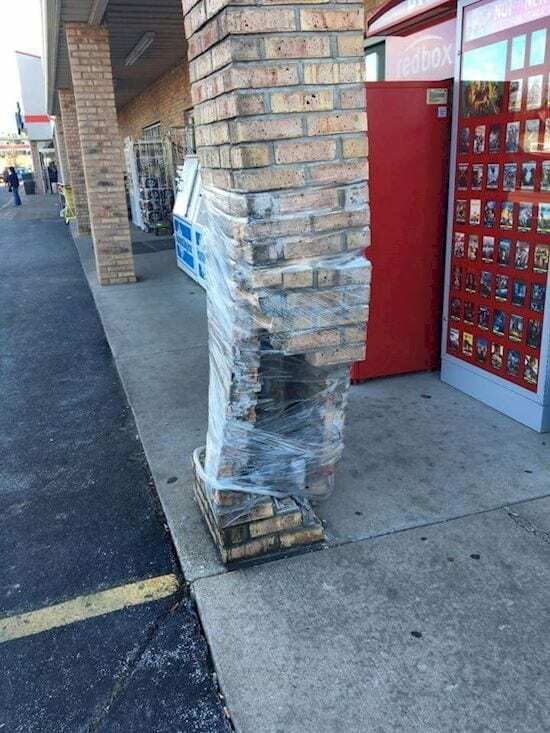 From this picture, it’s clear that this column wasn’t built well in the first place, but whoever was sent in to patch it up definitely didn’t try all that hard to make it work. If even bricks have started to crumble and tumble, then a tight covering of plastic is certainly not strong enough to help. This whole thing probably weighs a ton, meaning it could seriously injure someone should it fall entirely. They should probably invest in someone more professional ASAP. This could be a marketing technique to make potential shoppers see the entire ensemble on the model as two separate pieces, but we believe this was the job of a confused billboard hanger who clearly failed his 6th-grade biology quiz on the topic of the human anatomy. Marketing-wise, a lot could be learned from the way the ad is split into two separate pieces that do not connect – it does force the viewer to focus on each item separately. 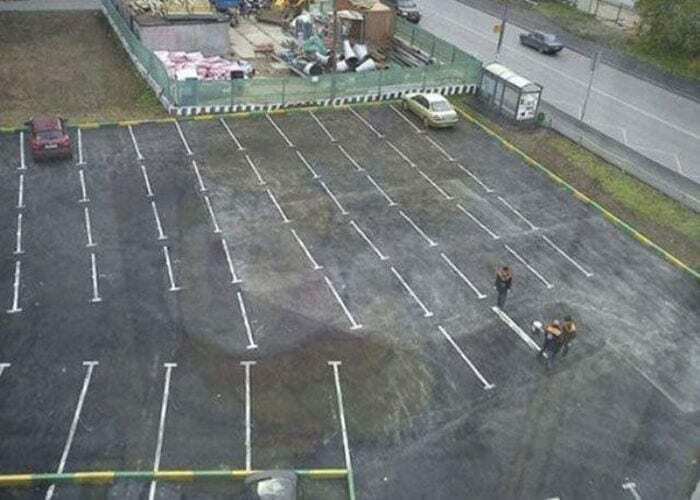 We have absolutely no idea what the workers were thinking when they laid out this parking lot. Was there no planning beforehand? Any car that entered this parking lot was set for disaster, not only would they never be able to get out of the space if there was anyone parked behind them, but chances are that it would all end in a pile up. The construction workers look to be standing around in a circle, looking at the work they messed up so terribly. 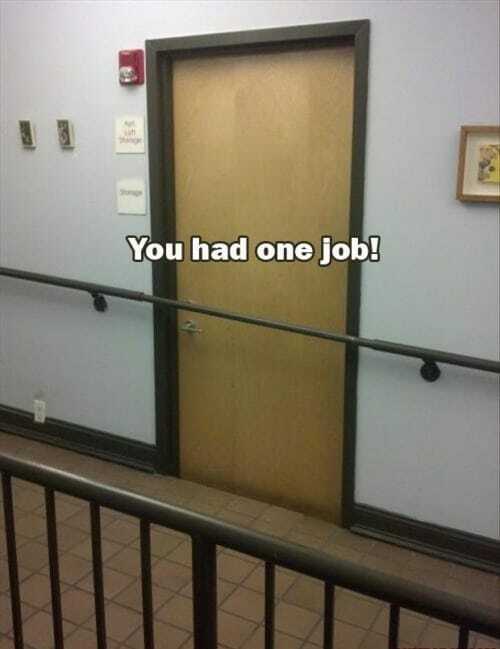 Just looking at this work fail could make the vast majority of people panic. 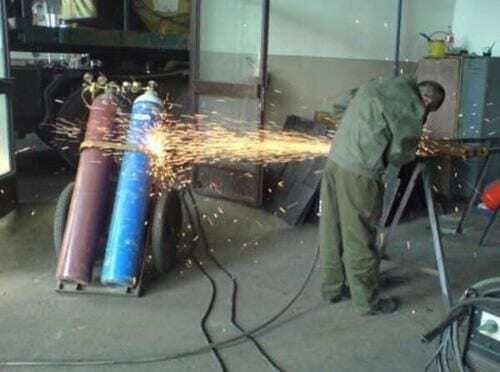 This worker was clearly not clued in on health and safety at work, and that is quite worrying considering he is working with dangerous power tools and hazardous equipment. Those gas cylinders should have been moved as well away from the fire as possible, this is a huge accident waiting to happen. 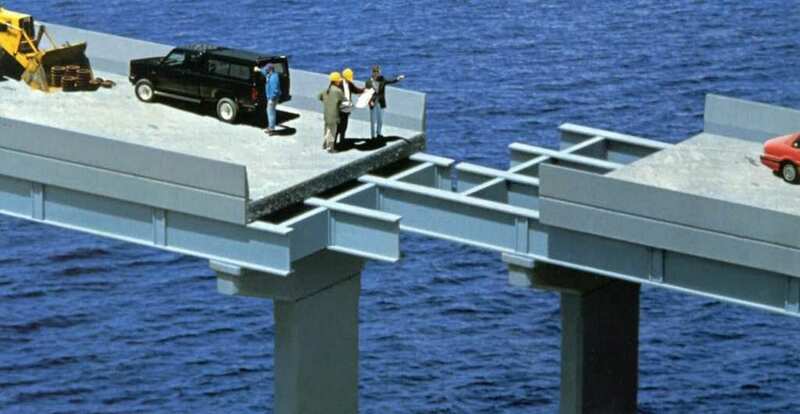 More importantly, why has the witness taken a photo and not saved this man from a potentially fatal incident?! Which ever employee thought this was going to work out probably no longer has a job. 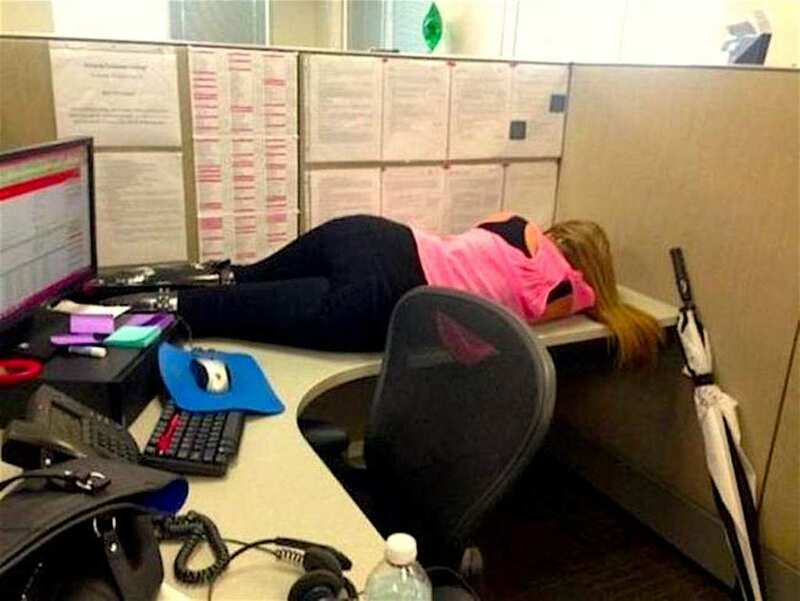 Hopefully, no one checked out her cubicle.. Someone in the editing room got a serious laugh behind the scenes. 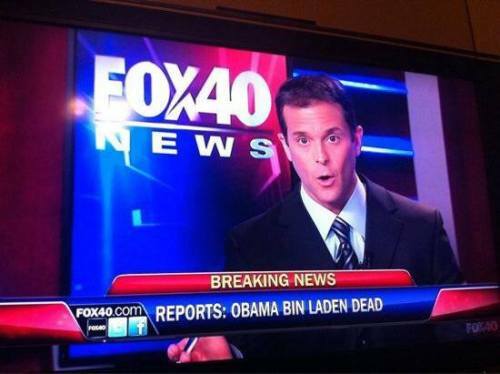 Hopefully the news anchor could also laugh at herself in this unfortunate position. 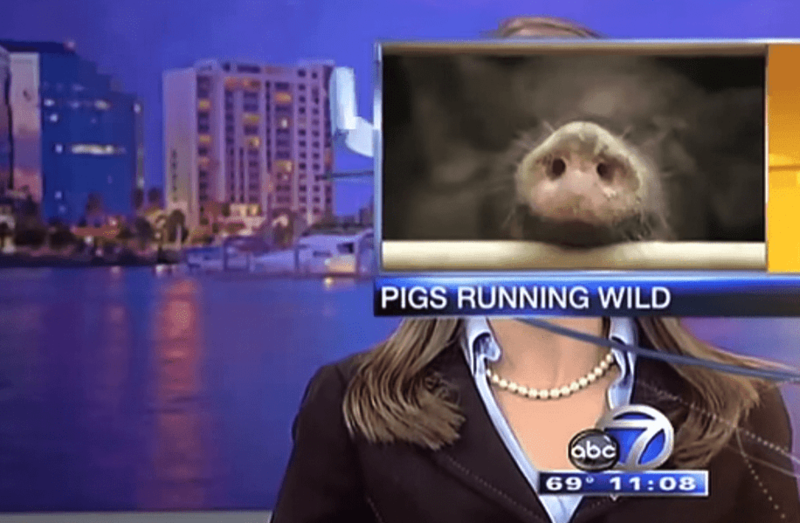 Even though nobody likes to be called a ‘pig,’ this is still pretty hilarious. We had no idea that pigs wore pearls and fancy blazers. 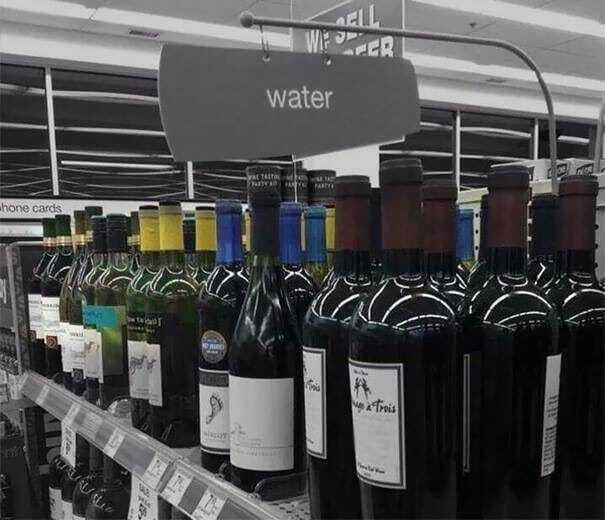 Perhaps whoever positioned this sign reading ‘water’ above the wine bottles was deeply affected by the last Sunday Mass they attended, since turning water into wine was a miracle done by Jesus, not a Walmart employee. Another possible reason for this confusion is that someone with a drinking problem wanted to suggest there is nothing wrong with having a glass or two of wine in the middle of the day – it is just like having a drink of water! 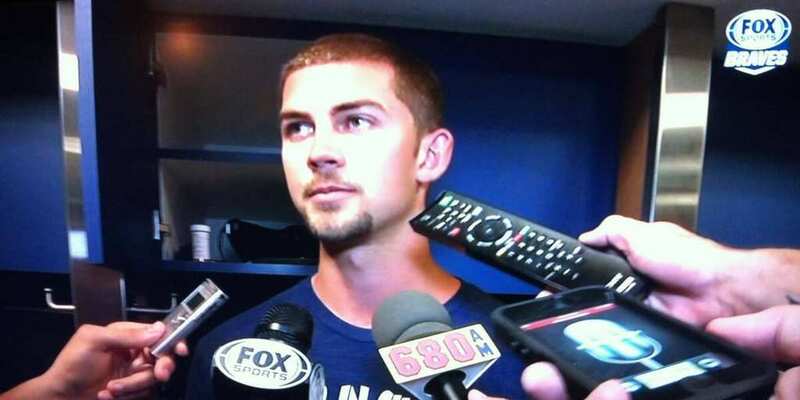 Cody here was clearly having a laugh while he was on the job. Who can blame him? Sometimes when you’re stuck on a shift and the store is slow, you do what you can to entertain yourself while you wait for customers. Of course, he probably thought the joke he was making would help him in other areas too, like if a cute girl came in to order pizza. Unfortunately, the store manager was not amused. 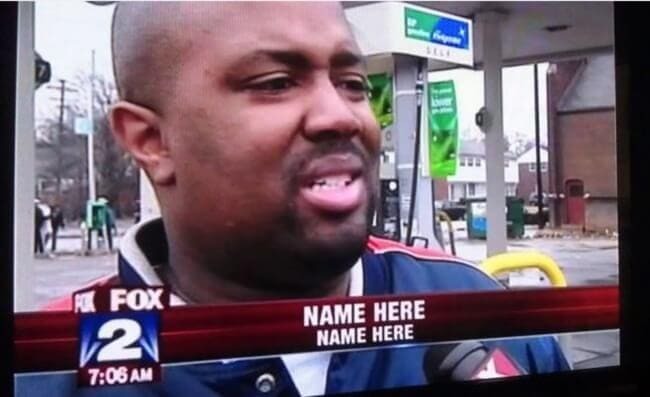 We doubt the man in the picture below intended on keeping his identity a secret, which means ‘Name Here’ is either the man’s name and occupation, or the channel’s executive wanted this guy’s 15 minutes of fame to be shorter than the phrase suggests. The local news does it again, but this time a major mistake was made and it is all due to one simple misplacing of a letter. We wonder if the news anchor seen in the picture below pronounced the name of the deceased appropriately, or if he read the incorrect name as was projected into his teleprompter. Although it was not his fault if he did the latter, both probably ended up getting the boot on account of shocking one too many viewers. Being dedicated to your job is one thing, but this girl is showing so much commitment, she should get employee of the year! 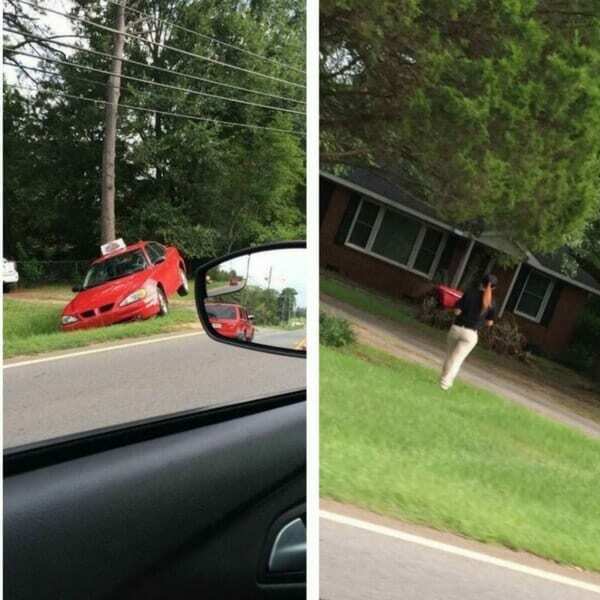 Since the pizza place she works at as a delivery girl has a strict ’30 minutes and it’s at your doorstep’ rule, if she was going to be as much as a minute late, the pizza would have been deducted from her salary (which was not as high as one would hope, anyway). They say teachers change the world one child at a time, but the underpaid educators of the future also have a different role – one they cannot be properly taught themselves, but are only able to acquire over time, through earned experience – the role of knowing how to handle the children. Teaching the required material is one thing, but dealing with adolescent kids who have anything but learning on their minds is quite another, as can be seen in the picture below. If this is not an accident waiting to happen, we do not know what is! 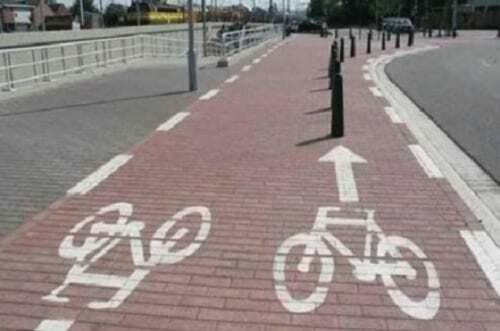 The person that was put in charge of painting the sidewalk with the bike riding direction should have stopped to think before obeying orders, since there is clearly no logic to what has been painted. It is a good thing the sidewalk is wide enough to enable riders coming from both directions to ride safely, otherwise, this could have been a very dangerous path. If you ever wondered why it was called snail mail, this might be the reason. 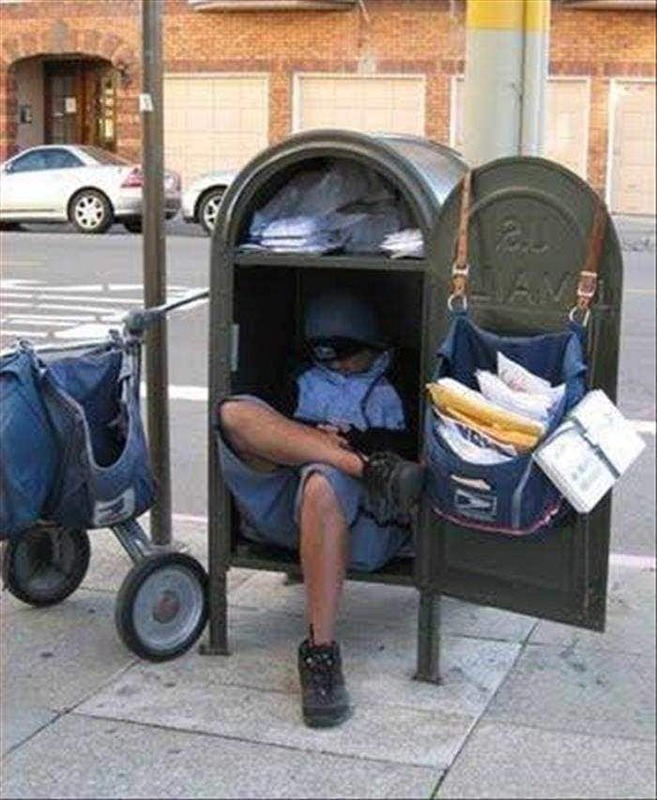 When this mailman was caught not only snoozing on the job, but napping in the mailbox to boot. It’s hard to keep mail safe when your sleeping with all of the mail readily accessible, though if anyone who considers stealing some of it knows what’s best for it, they won’t even try. Perhaps this is the reason that it’s a crime to steal someone else’s mail. It seems someone should have left clearer instructions for whoever installed the bathroom door, since it is customary that a toilet stall will have a door for more privacy. 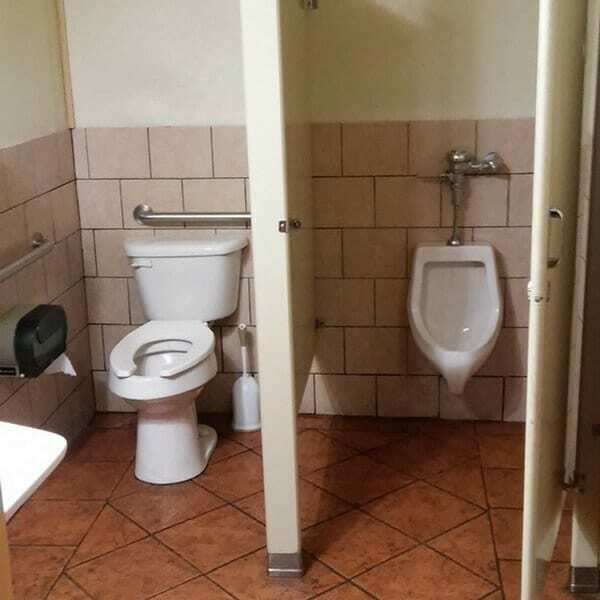 Since a man using a urinal will stand with their front towards the wall, a door is not always required, as the private areas are mostly hidden as it is. As for toilet seats, even the most open individual probably would not want to excuse themselves without a door attached to the stall. 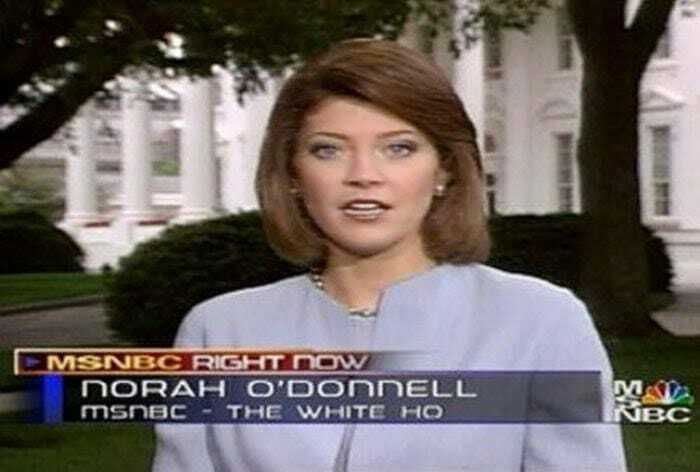 We bet Norah O’Donnel did not appreciate the abbreviation below her name. This spelling mistake could have been easily avoided. Perhaps someone in the editing room was playing a joke on her and wanted to have a good laugh.